Nutritious & Delicious, Treat Your Family to The Benefits of This Exceptional Olive Oil. Our exemplary Olive Oil is hand-harvested, ice-pressed and made in small batches to preserve the health benefits and exquisite taste. MaryRuth’s, in partnership with Rallis Olive Oil, harvests and bottles this unadulterated, unfiltered, raw olive oil in Soulinari, Greece. Since climate, geography and altitude are instrumental to grow times and quality of olives, we chose Soulinari with care. Not only is only a few miles from the founding epicenter of the Koroneiki Olive variety, but it is far enough inland not to be affected by the Mediterranean salt air and rests at an altitude 300m above sea level, producing incomparable Koroneiki olives. Harvested by hand & made in small batches, our olive oil is made with a minimal carbon footprint. We process our olives in the absence of heat and rely on nature to recycle water and nutrients to the soil. The impeccably rich taste of USDA Organic, Raw, Non-GMO, hand-picked olives is protected by high quality glass bottles, preserving freshness and avoiding oxidation by shielding the oil from harmful ultraviolet rays. The Ice-Press Method is significantly colder than traditional cold-pressed olive oils; the near absence of heat allows the oil to retain the highest quality of nutrients and taste, with no chemical interference. Not only does Extra Virgin Olive Oil contain healthy fatty acids, vitamins E & K, and antioxidants, but daily consumption is shown to fight inflammation and reduce the risk of heart disease and strokes. Each bottle comes with 12 fl. oz/375ml, or 25 servings. For best taste, store in a cool, dark place out if direct sunlight. How to use: Toss with your favorite salad, or try out MaryRuth's Raw Ranch Salad Dressing Recipe. Q: What does “Ice-pressed” mean and why is it good? A: Our Organic Ice-Pressed Olive Oil is pressed at temperatures 20-30x colder than traditional cold pressed olive oil. The near absence of heat allows our ice pressed olive oil to retain the highest quality of nutrients and taste, with no chemical interference. Q: Should this Olive Oil be refrigerated? A: Whether or not you choose to refrigerate your olive oil is entirely up to you. Though not necessary, it will not hurt the product to be refrigerated. If you tend to use your olive oil quickly or you live somewhere with a cooler climate, you shouldn’t need to refrigerate it. But if you buy it in large quantities, go through it slowly, or live somewhere with a warmer climate, keep the bulk of your olive oil in the fridge and, if you so choose, keep a small supply in a darkened glass bottle for quick access. Know that if you choose to keep your olive oil stored in the fridge, that it may likely go cloudy; a few minutes at room temperature should help revert it back to its natural state. Q: What is the polyphenol count of MaryRuth’s Olive Oil? A: The polyphenols in our Olive Oil range between 280-400 mg/kg. Non-bitter oils contain <220 mg/kg polyphenols, where lightly-bitter oils range between 220-340 mg/kg. Polyphenols have anti-inflammatory properties, the ability to absorb free radicals, and have a positive impact on cardiovascular disease. What people sometimes don't know is that olive oil contains 30 other phenolic compounds. That's why a high content polyphenol olive oil is so amazing! Q: What is MaryRuth’s favorite way to use the olive oil? This is the best olive oil I have ever used! So Fresh and aromatic. Sometimes I pop the cork to have a smell or a quick spoonful, Yum!! I order this product via subscription from M.R. 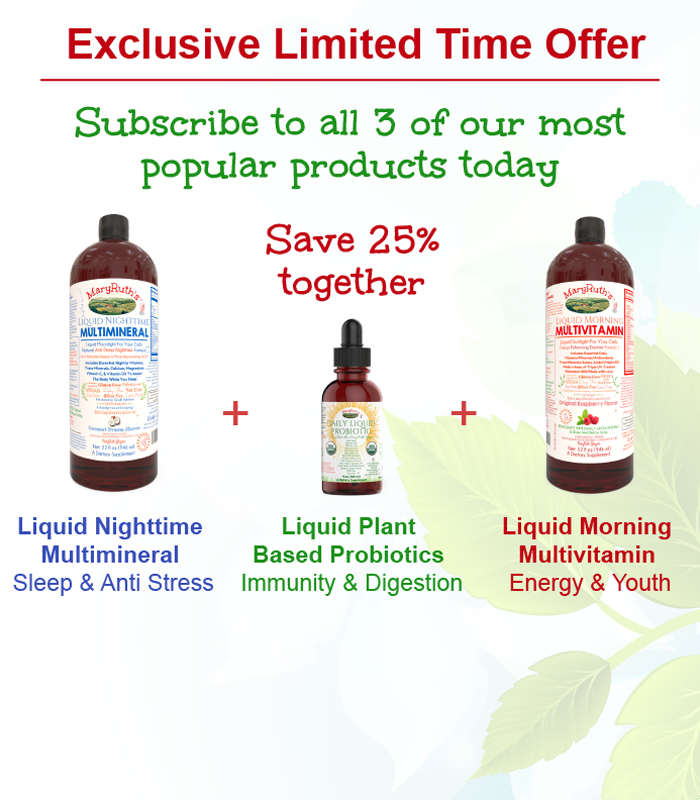 Organics' website, and like to keep an extra bottle or two on hand for gift giving. This product takes olive oil to an entirely new level. I highly recommend trying it. I had never heard of ice pressed olive oil but all of MaryRuth's products have impressed in the past so I gave it a try. You feel like you just had olive oil pressed TODAY, so fresh...love her Raw Ranch Caesar dressing recipe with it too!! !